I can totally imagine my grandma with me this evening as I made dinner. 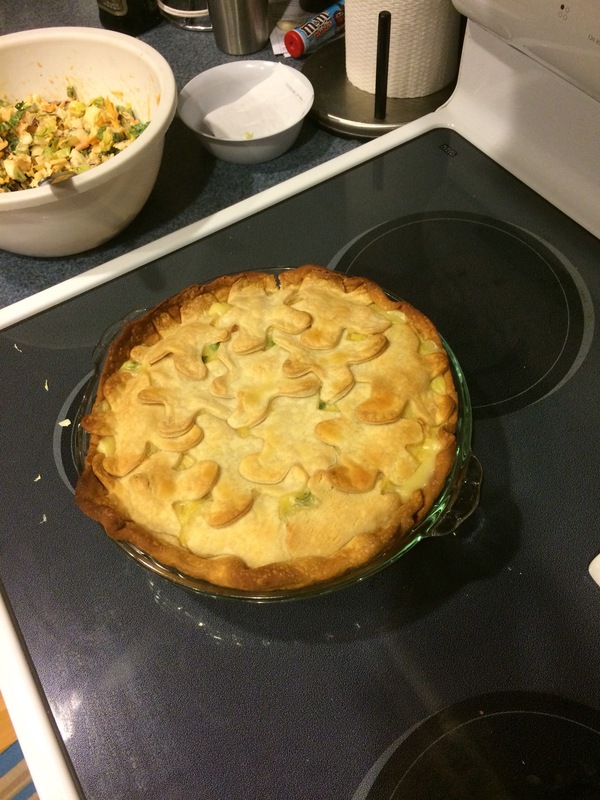 We had some extra chicken left from dinner last night and I had it in my head to make a pot pie. I never have, but was wanting to nonetheless. I got some groceries today and in that trip I also purchased some Banquet brand frozen, individual pot pies…just in case mine turned out poorly. Ha ha. Needless to say, the frozen pies are still frozen. This was one of the simplest recipes I’ve done in a long time. AND it is my own. Although, I’m sure there are many other recipes the same or similar, but I digress. This is a two-crust pie. You could make it in a ceramic baking dish and just have one crust on top, but I think the two crusts make a huge difference. 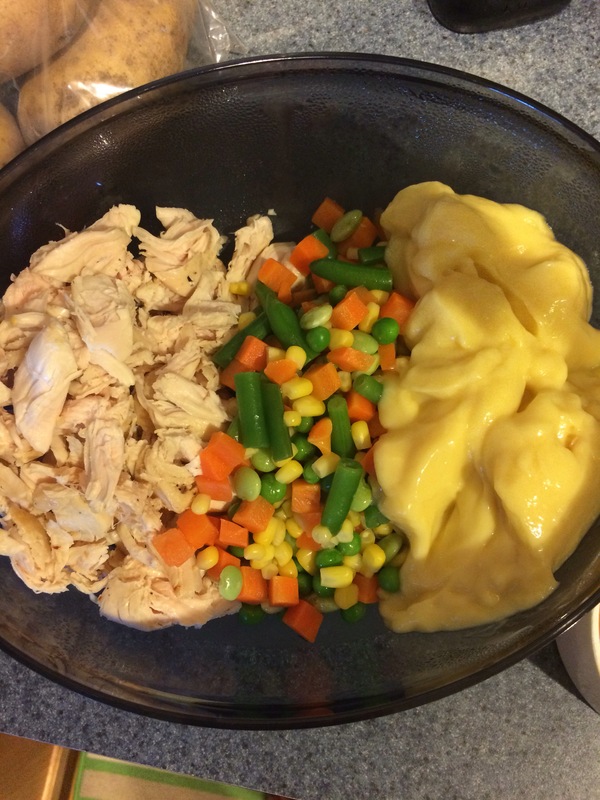 It’s simple: veggies, chicken, cream of (insert mushroom, chicken, or broccoli here), some broth and that’s it! I decided to be a little creative with my top crust and use shapes instead of slits to vent the heat. Preheat oven to 400°. Mix the chicken, veggies, soup and stock. Pour into pie plate lined with first crust. 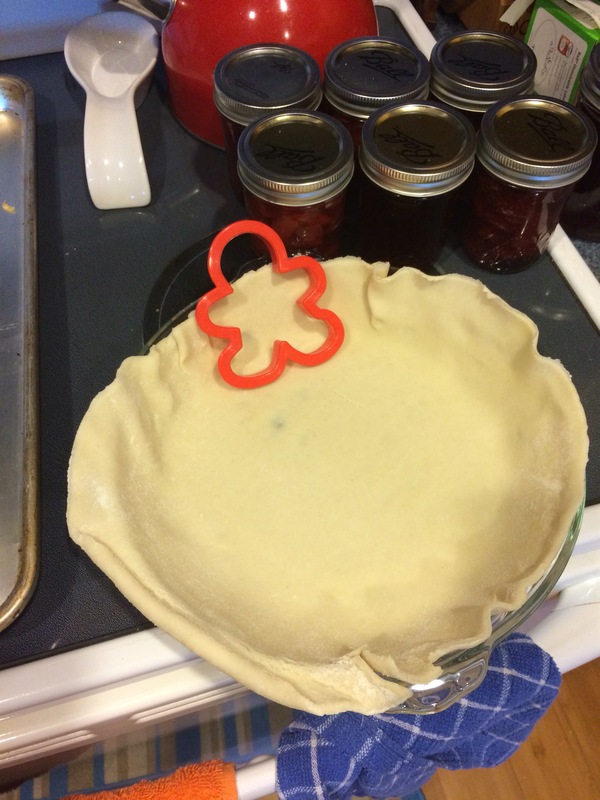 Place second crust on top and either make shapes with cookie cutter or poke holes in top to vent. Bake for approximately 40 minutes, until the middle/top is golden brown. Keep an eye on the edges and cover with foil if they get too brown. But, she could/may have used fresh veggies! Of course she would have…I would too if I had a half acre garden.